Mercedes-Benz F 800 | What Car? 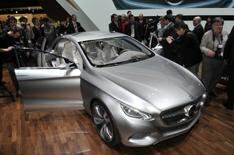 Mercedes-Benz has revealed its futuristic F 800 Style concept car at the Geneva motor show. The F 800 Style concept car gives us a look into the future of Mercedes-Benz. Previewing this years second-generation CLS four-door coupe, and signalling the overall design direction for the brand, the F 800 is packed with future-fuel drivetrains and a suite of new interfaces and technologies to make life at the wheel safer and easier. The first is a petrol, plug-in hybrid with a combined output of 403bhp from its 3.5-litre engine and li-ion powered electric motor. Total range is put at 435miles, although just over 18 miles would be possible on battery power alone at speeds of up to 75mph. Using maximum available output, the hybrid could accelerate from 0-62mph in 4.8 seconds and hit a restricted top speed of 155mph. Preliminary figures suggest the car could have official emissions as low as 68g/km and combined economy of 97mpg. The second version is powered by a fuel-cell that has zero exhaust emissions. Mercedes says it could do 0-62mph in 11 seconds, top 110mph and have a range of 373 miles. Mercedes has recently showcased how far advanced it is with its fuel-cell programme in the B-Class all we need now is a refuelling infrastructure. The F 800 has a human-machine interface (HMI) touchpad that builds on the current Comand system found in the companys cars. In keeping with the popularity and functionality of Apple products such as the iPhone, the system will allow users to control a range of vehicle functions with movements on the touchpad. Two cameras monitor the movement of your hand over the touchpad and project a live transparent image of it over the menus and images of the centre console display. Theres also a development of the Distronic Plus adaptive cruise control. While that system can already accelerate and brake cars automatically as other traffic slows and accelerates, the new Distronic Plus Traffic Jam Assistant can also steer to follow the car in front through bends at speeds of up to 25mph. Mercedes has said that the driver will always remain in ultimate control, and take ultimate responsibility, so you still have to hold the wheel while the system steers for you.